Kira has the most soulful eyes. She loves to sleep in piles of blankets and to be petted and read to. 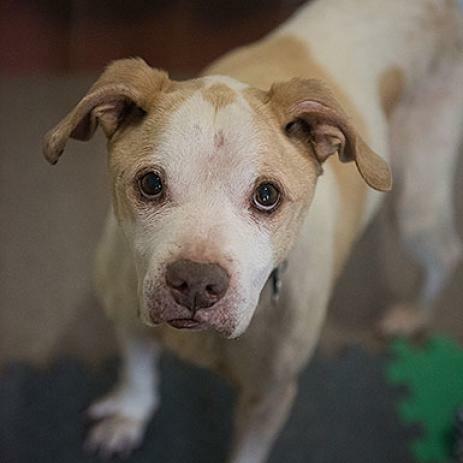 Born in 2008, she is a sweet senior dog who enjoys short, easy walks. Kira was originally living in a shelter and came to Best Friends through a rescue organization in New York. Her health has been improving greatly, and Best Friends vets and caregivers are working to keep her healthy and happy. Kira takes prescription medication and eats a prescription diet. She has a touch of arthritis, which may worsen with age. Kira can be picky about living with other dogs, but she lives happily with her friend Russ with whom she came to Best Friends. She's looking for a comfortable home that is easy to move around in and has plenty of blankets for her to curl up in.